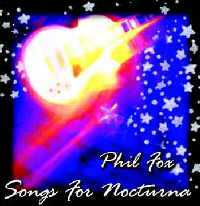 Phil Fox's Songs for Nocturna is available online at CD Baby.com (where you can sample the tracks) and at Amazon.com! Visit the SongStories Page or click on individual songs to find out what goes into this "diverse collection of pop and rock compositions" (Kent Kimes, The Sun News). You can find Wicked Gift's latest album, Down for the Summer, at Sounds Better, Monkey Business, and Kilgore Trout, and online at CD Baby.com. Phil's old new album, Stained Glass Scars by Wicked Gift, is available at CD Baby.com. Visit http://www.wickedgift.com to find out more! "Someone From Away From Here" received Honorable Mention in the 2003 John Lennon Songwriting Contest. Sample it now at CD Baby.com or see digital distribution info below. Download individual Nocturna tunes (or the whole CD) at Buymusic, Rhapsody, Napster, Apple iTunes, and Musicmatch. Stained Glass Scars is now available at AudioLunchBox, AppleiTunes, and DiscLogic.